Providing Alternatives To Hopelessness And Solutions For Tomorrow. When you have teenagers or children that soon will be; parenting gets more complicated. The teenage years are emotionally charged and a time of rapid change. They can be challenging for all family members and if not handled correctly, can lead to frustration or problems. 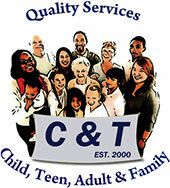 The Children & Teenagers Foundation, Inc. is ready to help you. We are community-based and provide an array of mental health and support services and referrals. Many services, including psychological and psychiatric assessments, are available for teens and parenting skills training is available for adults. We're committed to the people in the communities we serve and enjoy collaboration with other agencies to assist families. Contact us today for help that is readily available. The Children & Teenagers Foundation, Inc. provides children, teenagers, adults, and families with clinical and therapeutic services to encourage and support healthy growth and development. Our foundation in Decatur, Georgia, has served the Metropolitan Atlanta area since 2000, teaching families to be self-sufficient while helping to decrease risk factors and increase stability. Our founder and Director, Betsy Miller, has extensive training and experience working in criminal justice and child welfare. C & T strives to preserve families and promote safety, permanency, and the well-being of children, adolescents, adults, and families by providing individual family and other support services.